If you are in the Jaco Beach and Los Suenos area looking for the best way to have an amazing day of unique experience and adventure – LOOK NO FURTHER! 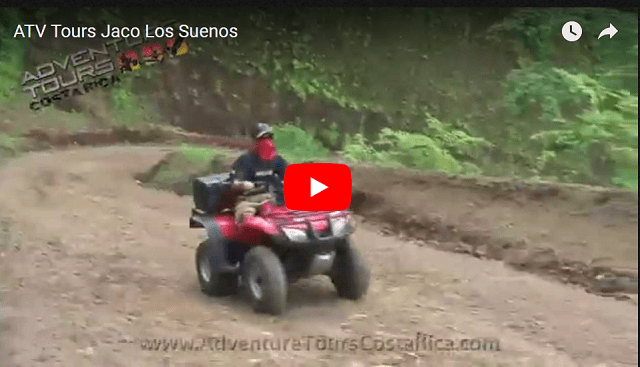 Our signature Jaco Beach and Los Suenos adventure day trip – The ATV Canopy Waterfall Adventure – combines the thrill of the Los Suenos zip lines, with our 4-hour ATV Tour to the local waterfalls and neighboring rainforest. All the adventure is topped off with a delicious traditional lunch in the Costa Rican rainforest – 2000 feet above sea level! Enjoy the chance to see exotic Costa Rican wildlife. Soar through the canopy like a bird. Get a little off-road, and get a little rainforest on ya. Splash around in one of Costa Rica’s many beautiful waterfalls. Enjoy a delicious and authentic Costa Rican meal in one of the country’s most exotic and serene locations. 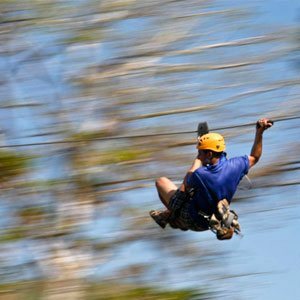 Picking up at 7:30am, you are first off to the Los Suenos Canopy Tour where you will slide down 13 breathtaking zip lines. The second to last cable is the longest in the area at 2400 feet – you will zip almost ½ mile! After the tour, you will stop by the canopy office to enjoy a little pineapple and watermelon, as well as a chance to pick up a disk of photos of your tour. 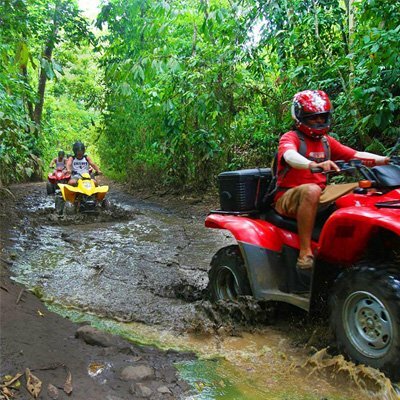 By 11:30am you will have your motorcycle helmet on and learning the in’s and out’s of riding your own ATV up in to the rainforest – Mules/Rhinos & tandem ATVs also available for the faint of heart. Within minutes you will be in the secondary rainforest on your way to an amazing Costa Rican waterfall. "(...) just kick back and enjoy the serenity of the surroundings while waiting on your lunch." After rinsing off in the waterfall, we are on our way to Restaurante Paz del Campo – a gorgeous restaurant and tilapia farm in the middle of the mountains where you can try your hand at fishing from the pond, or just kick back and enjoy the serenity of the surroundings while waiting on your lunch. After lunch we make our way back to sea level passing rural Costa Rican landscapes, and on clear days amazing views of the Pacific Ocean and the Nicoya Peninsula from across the bay - truly one of the most stunning views in the entire country. You will return back to your accommodations around 3pm with amazing photos, an unforgettable experience, and ready for a nice hot shower!